Every community needs a little hometown parade – the kind you’re watching one year, riding in the next, and maybe selling popcorn the year after that. In Orange, that parade was the Orange May Festival. It was our biggest community celebration for decades, until the Street Fair came along. The May Festival began in 1933, in the depths of the Great Depression. Orange was looking for a way to laugh away the hard times, so everybody dressed up to celebrate the “pioneer days” (which for them meant the 1890s) and held a parade through downtown. In the pioneer days, May Day was an annual celebration here, with picnics, parties, and baskets of spring flowers. It’s also about the time you start picking Valencia oranges, which gave another excuse for the celebration. The May Festival parade caught on fast, and by 1935, the Orange Daily News estimated that 15,000 people turned out for the parade. Other events were later added, including a separate youth parade, street dances, concerts, sporting events (often featuring Orange’s women’s softball team, the Lionettes), a horse show, and plenty of food and fun. A May Day Queen was selected from among the girls at Orange Union High School (a tradition that later morphed into the Miss Orange pageant), and by 1951, a carnival was added in Hart Park, with rides, food, and attractions. With the coming of World War II, the May Festival celebration went dark, with only one parade – 1944 – held between 1942 and 1946. In 1947 and ’48, the parade was held in September, and billed as the Orange Harvest Festival (though to be fair, you can still harvest Valencia oranges in September). The Chamber of Commerce sponsored the celebration for many years, with help from various other groups in town, including the Junior Chamber of Commerce (the Jaycees) who took over the whole shebang in 1964. By then, the May Festival had grown into almost a full week of events. Elaborately decorated floats, marching bands, antique automobiles, and all sorts of local organizations joined in the parade. This photo, from 1969, features Miss Orange and her court rolling down Chapman Avenue on their own float. But with the coming of the Orange International Street Fair in 1973, the May Festival began to lose its luster. The crowds dwindled through the 1980s, but it was the recession of the early 1990s that finally put an end to the event. Early in 1992, the city announced that they could no longer afford to help subsidize the celebration or pick up the added costs for police patrols and clean up, and that was that. Now, after a quarter of a century, plans are in the works for a revived parade – and you can bet I’ll be there. 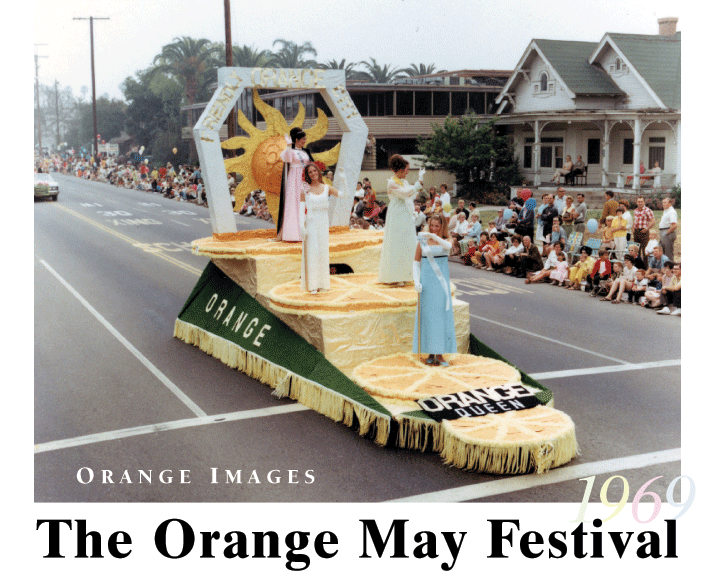 Select for more information about this year’s upcoming Orange May Parade.